The Kray twins, Ronald and Reginald, was two of the most feared figures on the London scene during the 1960s, but also two of the most fascinating in terms of what they accomplished. Though their reputation as hard-boiled gangsters preceded them, they also ran prosperous night clubs and even hung out with various celebrities like Barbara Windsor and Joan Collins – they were both hated and loved at the same time. Their life story is drenched in such extremes that writer-director Brian Helgeland has taken it upon himself to portray them as a combination of how people saw them, both as ruthless thugs and as prominent businessmen – they are, as the title indeed suggests, a combined legend of the London crime scene. Helgeland, an Oscar-winner for his screenplay of LA Confidential, interestingly places events from the perspective of Frances Shea (Emily Browning), the young muse of Reggie Kray (Tom Hardy) who, along with brother Ronnie (also Hardy), intimidate their rivals with violence or the threat of violence – sometimes both – and gain the attention of police figures such as Leonard “Nipper” Read (Christopher Eccleston) during their long reign on top of London society. Placing the point of view angle from Frances, a figure with significant ties to the Kray’s infamous legacy yet is rarely talked about when discussing them, is an interesting angle for Helgeland to take; the character as depicted in the film has a heavily romanticised view of the Krays, more as the prosperous club owners than the thugs they really were, much like how most other people at the time viewed them. This allows us an insight into both the good and the bad insights of the Krays, and presents a balanced portrayal of figures who would have probably otherwise been handled as one or the other by another filmmaker. A prime example of this is a scene early in the film; shot in one take within one of Reggie’s clubs, not unlike a famous scene from Goodfellas, we first see the glamorous suits and dresses that patrons wear as live music plays swiftly in the background as Reggie and Frances pass various celebrities and other prime figures of society, but soon we are introduced to Reggie’s bullying tactics in a separate room – almost a different place entirely – as he intimidates and abuses criminal Jack “The Hat” McVitie (Sam Spruell) into paying certain debts. The scene demonstrates both the good and the bad about the Kray legacy, and allows us to see it from all angles. Much has already been made about the decision to cast Tom Hardy as both Kray twins, using split-screen and CG trickery to put both characters on-screen together at the same time. At best it’s hardly noticeable, although the CG illusion is shattered very briefly in select shots, but not that many and the effects are for the most part seamless. Hardy himself is tasked with a very difficult job of giving both Kray brothers distinct and opposing personalities, and he manages to pull it off flawlessly. His Reggie is much more clean-cut, letting his swagger mostly dominate with his more violent side opening up like a can of worms at opportune moments; he’s clearly the more competent of the two, and Hardy’s easy identity as a leading man shows many times in this particular performance. His Ronnie, however, is far more unpredictable; an open homosexual (“I’m a giver, not a receiver,” he insists) with a history of mental illness, at one point even being called a paranoid schizophrenic by a prison psychiatrist, he is far more dangerous than anyone gives him credit for due to his erratic behaviour and psychopathic tendencies, which Hardy channels his past titular role in Bronson in order to convey here with terrifying conviction. It’s an impressive dual performance by Hardy, with the CG trickery eventually fading into the background thanks to the sheer magnetic energy of both performances – and hey, any film that gives us two Tom Hardys for the price of one is fine in our books. Like most gangster films, it’s not without its more sinister moments – the firm grip of the Krays on the East End is infamous by this point, and this film goes out of its way to show the lengths they go to in order to get exactly what they want. This varies from intimidation to threats of violence against loved ones to even cold-blooded murder, and all are handled in a way that is informative without glamorising any of it. Sometimes, it can be darkly comical – an early montage shows the Krays getting their own against rival gang leader Charlie Richardson (Paul Bettany in a cameo role) and his nefarious Torture Gang, including driving a truck through a small diner and eventually ending with Richardson’s arrest during the 1966 World Cup Final – but it never becomes acceptable to root for. We’d also say, to anyone who may have been associated with the Krays in real life, the creative liberties taken with some of the story may prove to be upsetting for some – an article for the Daily Express reports on members of Frances’ family being disgusted with her portrayal here, which shows her being abused by her drunk husband Reggie and eventually making a tragic decision much later in the film. 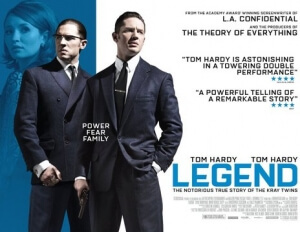 Although it won’t resonate with many who dealt with the real-life Kray twins, Legend keeps their terrifying presence alive for better or for worse. Legend is an entertaining and watchable biopic of the Kray twins, with Tom Hardy giving a layered and fantastic dual performance as both brothers and writer-director Brian Helgeland making interesting choices to portray them on-screen.